Kylie Jenner & Travis Scott Step Out For Family Meal Amid Rumors Of Relationship Drama! Home › Kylie Jenner › Kylie Jenner & Travis Scott Step Out For Family Meal Amid Rumors Of Relationship Drama! Amid reports that their relationship isn’t what it used to be, Travis Scott and Kylie Jenner were actually spotted out to dinner with Stormi Webster! Marking the first time they’ve been seen in public together since she allegedly accused the rapper of cheating, the family stepped out for a meal at Sweet Chick in El Lay on Thursday night! Related: Kylie Jenner Reveals If She Wants More Kids! Which must mean dinner went well, right?? As we previously reported, the 21-year-old seemingly found “evidence” that her baby daddy cheated late last month, leading to a huge blow up. The 27-year-old actually postponed his following Buffalo concert on his Astroworld tour reportedly over the family matter — though reps claimed he was ill instead. Sounds like Travis couldn’t have come back to Los Angeles at a more perfect time!! Related: Travis Scott Leaves Flirty Comment On Kylie Jenner’s Pic! Especially as his baby momma continues to spark more headlines! 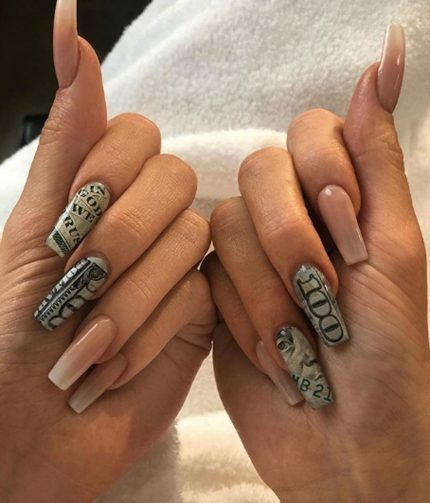 And just to cement her billionaire status even further, the young KUWTK starlet revealed to her Instagram followers yesterday her new money manicure! We hope those are some fake $100 bills pasted on her nails!! The last thing Kylie needs is a call from the U.S. Treasury Department explaining to her how defacing American money is a felony. LOLz! Lil’ Kim‘s manicurist Bernadette Thompson learned that lesson after using real hundreds and fifties on the rapper’s nails back in 1993.